In Canada, 8% of children attending allergy clinics were found to be allergic to Ganoderma, a basidiospore. Pleurotus ostreatus, cladosporium, and calvatia cyathiformis are significant airborne spores. Other significant fungal allergens include aspergillus and alternaria-penicillin families. In India fomes pectinatis is a predominant air-borne allergen affecting up to 22 percent of patients with respiratory allergies. Some fungal air-bourne allergens such as coprinus comatus are associated with worsening of eczematous skin lesions. Children who are born during autumn months (during fungal spore season) are more likely to develop asthmatic symptoms later in life. ^ Goldsby, Richard A.; et al.. Immunology (5th ed.). New York: W.H. Freeman. ^ Rosmilah, M; et al. (December 2008). "Characterization of major allergens of royal jelly Apis mellifera". Trop Biomed 25 (3): 243–51. ^ "Health Canada: Food Allergies". Archived from the original on 14 June 2007. Retrieved 2007-06-09. ^ "CFIA: Revised Labelling Regulations for Food Allergens, Gluten Sources and Sulphites (Amendments to the Food and Drug Regulations)". Retrieved 2011-02-28. ^ "Wood Allergies and Toxicity". The Wood Database. Retrieved 2014-04-24. ^ Gregory, PH. ; Hirst, JM. (September 1952). 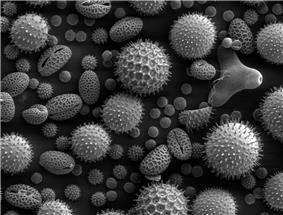 "Possible role of basidiospores as air-borne allergens". Nature 170 (4323): 414. ^ Herxheimer, H.; Hyde, HA. ; Williams, DA. (July 1969). "Allergic asthma caused by basidiospores". Lancet 2 (7612): 131–3. ^ Hasnain, SM. ; Wilson, JD. ; Newhook, FJ. (May 1985). "Fungal allergy and respiratory disease". N Z Med J 98 (778): 342–6. ^ Levetin, E. (April 1989). "Basidiospore identification". Ann Allergy 62 (4): 306–10. ^ a b Horner, WE. ; Lopez, M.; Salvaggio, JE. ; Lehrer, SB. (1991). "Basidiomycete allergy: identification and characterization of an important allergen from Calvatia cyathiformis". Int Arch Allergy Appl Immunol 94 (1–4): 359–361. ^ Sprenger, JD. ; Altman, LC. ; O'Neil, CE. ; Ayars, GH. ; Butcher, BT. ; Lehrer, SB. (December 1988). "Prevalence of basidiospore allergy in the Pacific Northwest". J Allergy Clin Immunol 82 (6): 1076–1080. ^ Koivikko, A.; Savolainen, J. (January 1988). "Mushroom allergy". Allergy 43 (1): 1–10. ^ Khot, A.; Burn, R.; Evans, N.; Lenney, W.; Storr, J. (July 1988). "Biometeorological triggers in childhood asthma". Clin Allergy 18 (4): 351–8. ^ Hasnain, SM. ; Wilson, JD. ; Newhook, FJ. ; Segedin, BP. (May 1985). "Allergy to basidiospores: immunologic studies". N Z Med J 98 (779): 393–6. ^ Santilli, J.; Rockwell, WJ. ; Collins, RP. (September 1985). "The significance of the spores of the Basidiomycetes (mushrooms and their allies) in bronchial asthma and allergic rhinitis". Ann Allergy 55 (3): 469–71. ^ Lehrer, SB. ; Lopez, M.; Butcher, BT. ; Olson, J.; Reed, M.; Salvaggio, JE. (September 1986). "Basidiomycete mycelia and spore-allergen extracts: skin test reactivity in adults with symptoms of respiratory allergy". J Allergy Clin Immunol 78 (3 Pt 1): 478–485. ^ Weissman, DN. ; Halmepuro, L.; Salvaggio, JE. ; Lehrer, SB. (1987). "Antigenic/allergenic analysis of basidiomycete cap, mycelia, and spore extracts". Int Arch Allergy Appl Immunol 84 (1): 56–61. ^ Liengswangwong, V.; Salvaggio, JE. ; Lyon, FL. ; Lehrer, SB. (May 1987). "Basidiospore allergens: determination of optimal extraction methods". Clin Allergy 17 (3): 191–8. ^ Tarlo, SM. ; Bell, B.; Srinivasan, J.; Dolovich, J.; Hargreave, FE. (July 1979). "Human sensitization to Ganoderma antigen". J Allergy Clin Immunol 64 (1): 43–49. ^ Lopez, M.; Butcher, BT. ; Salvaggio, JE. ; Olson, JA. ; Reed, MA. ; McCants, ML. ; Lehrer, SB. (1985). "Basidiomycete allergy: what is the best source of antigen?". Int Arch Allergy Appl Immunol 77 (1–2): 169–170. ^ Stephen, E.; Raftery, AE. ; Dowding, P. (August 1990). "Forecasting spore concentrations: a time series approach". Int J Biometeorol 34 (2): 87–89. ^ Dhillon, M. (May 1991). "Current status of mold immunotherapy". Ann Allergy 66 (5): 385–92. ^ Gupta, SK. ; Pereira, BM. ; Singh, AB. (March 1999). "Fomes pectinatis: an aeroallergen in India". Asian Pac J Allergy Immunol 17 (1): 1–7. ^ Fischer, B.; Yawalkar, N.; Brander, KA. ; Pichler, WJ. ; Helbling, A. (October 1999). "Coprinus comatus (shaggy cap) is a potential source of aeroallergen that may provoke atopic dermatitis". J Allergy Clin Immunol 104 (4 Pt 1): 836–841. ^ Harley, KG. ; Macher, JM. ; Lipsett, M.; Duramad, P.; Holland, NT. ; Prager, SS. ; Ferber, J.; Bradman, A. et al. (April 2009). 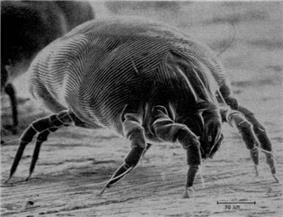 "Fungi and pollen exposure in the first months of life and risk of early childhood wheezing". Thorax 64 (4): 353–8. ^ Bublin M; Radauer C; Wilson IBH; Kraft D; Scheiner O; Breiteneder H; Hoffmann-Sommergruber K (2003). "Cross-reactive N-glycans of Api g 5, a high molecular weight glycoprotein allergen from celery, are required for immunoglobulin E binding and activation of effector cells from allergic patients". FASEB 17 (12): 1697–9. ^ "Seasonal Allergy — What to Know". Archived from the original on 14 April 2010. Retrieved 2010-04-09. ^ "Seasonal Allergies". Archived from the original on 12 April 2010. Retrieved 2010-04-09. ^ "Seasonal Allergies". Archived from the original on 15 April 2010. Retrieved 2010-04-09. ^ "Non-Sedating or Anti-Drowsy Antihistamine Tablets". Archived from the original on 11 April 2010. Retrieved 2010-04-09. ^ "Allergy shots". Archived from the original on 22 April 2010. Retrieved 2010-04-09.